12.00 noon – Lunch at Tuttons, Covent Garden – three courses + tea/coffee in a private dining room. Your Backstage Tour includes an introduction to the colourful history of the theatre, an insight into the redevelopment of the Royal Opera House and a look at aspects of current productions. 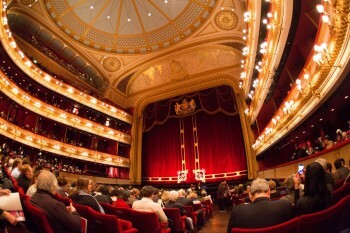 As the Opera House is a fully working theatre, each tour is a unique experience and may include opportunities to see the Royal Ballet in class, or the magnificent backstage technology in operation. Following our tour we depart for a three course lunch with tea/coffee in Covent Garden. After lunch we step into Theatreland and hear about Legends and Landmarks on a guided historical walking tour which last for 1 hour 15 minutes. 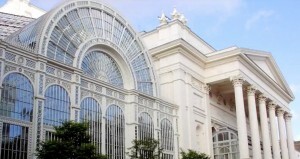 We shall explore the beautifully refurbished Royal Opera House both outside as well as inside via various stairs & open-air terraces. 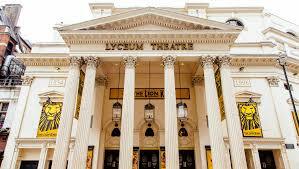 You will then be guided around the Covent Garden Piazza to see the Lyceum Theatre and Theatre Royal Drury Lane, with a full circuit of the building. 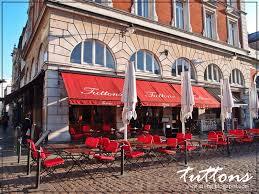 Situated on the famous Covent Garden piazza, Tuttons is one of the longest standing restaurants in central London. Well known for its location and history, they offer diners a unique experience overlooking the iconic piazza whilst enjoying a delicious menu that celebrates English cuisine and the best of British produce. For special occasions and private events they have two Vault dining rooms. Situated underneath the restaurant, the Vaults are a beautiful back drop to any event ranging from corporate meetings to birthday soirees. We shall need to provide your menu choices in advance for our lunch, so the menu is shown below for you to decide: Please let us have your choices before 10 April 2019. Please also advise us of any special dietary requirements.